Now that the CES dust has settled on Las Vegas — analysts, journalists and tech bloggers can’t seem to say enough about the Razer Blade Stealth Ultrabook, which is generating an impressive number of awards from “Best PC” and “Best of CES” to “People’s Choice Award.” Engadget, Mashable, TechRadar and SlashGear are just a few of the numerous publications that are praising the $999 Razer Blade Stealth. The gaming laptop runs Windows 10 and touts a 12.5-inch multi-touch display with IGZO 16:9 aspect ratio. 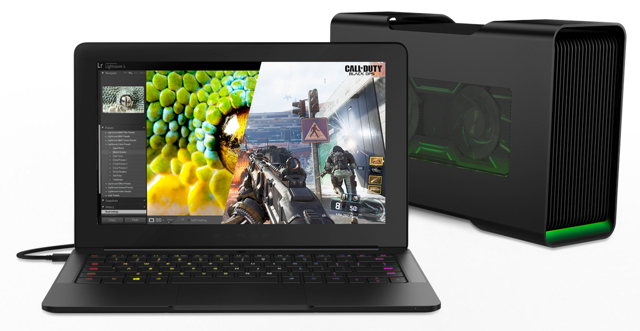 The Razer Core, an external graphics docking station, is also on its way. The Razer Blade Stealth is currently available to order online starting at $999 (it will also be available in Microsoft stores beginning next month). Pricing varies based on screen resolution and storage. The 4K model with 512GB SSD runs $1,599. The Razer Core is coming soon, expected within the first half of 2016.